Sponsored & hosted by Brunel’s SS Great Britain. Decorated by Simon Tozer. This piano is no longer available, it is being stored by it’s new owner Brunel’s SS Great Britain and may make a reappearance on sunny days next year. 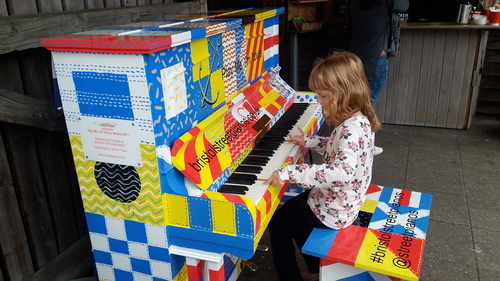 Having fun at the Brunel's SS Great Britain piano. Originally posted on Twitter by Ros Hewitt - A Nautical Medley. Name those tunes! Brunel's SS Great Britain, Bristol. Kids having fun at the SS Great Britain. Quite my favourite location this. Lovely looking out over the water and beyond and plenty of people passing by to listen to if they sat down and had a go. Not too busy to see a gap and jump in and have a go myself either. Thanks to Luke for organising again for another year. Did it again! There's just no stopping me now! 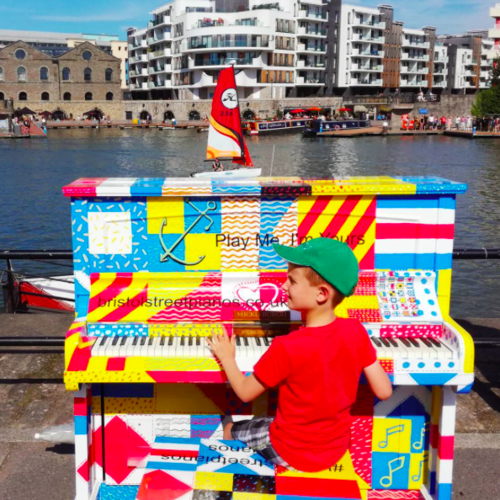 Thought you might like to see my 5 year old son adding more colour to your wonderful colourful piano. Thanks to all involved for a fantastic addition to the city! Here is Mr Steve Wilson with his matching man bag.